Dr. Pamela “Poison Ivy” Isley typically finds herself on the wrong side of the law. 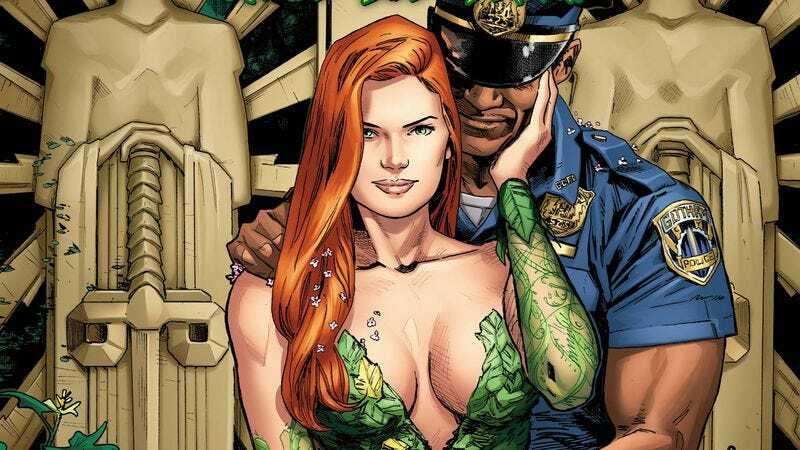 But she’s taking on a more heroic role in her new miniseries, Poison Ivy: Cycle Of Life And Death, which has her investigating the murder of her employer at the Gotham Botanical Gardens. Writer Amy Chu did strong work on the first issue establishing Pamela’s personality, supporting cast, and new occupation, and the preview of this week’s issue #2 increases the tension as Pamela starts interacting with the police and discovers that she is a suspect in the case. Caitlin Rosberg’s Comics Panel review of Poison Ivy: Cycle Of Life And Death #1 pointed out a disparity between Chu’s script and Clay Mann’s artwork. And there’s still a certain amount of oversexualization in these preview pages, like the opening shot of Poison Ivy sitting like a pin-up model on a giant budding flower. Mann has some very strong technique—the last page of this issue has a clever layout and a lot of energy—but it would be nice if he toned down his cheesecake tendencies to deliver visuals more in line with Chu’s story.